I have ordered Spicy Chicken McDeluxe well Muazzam with his LE Mega Mac. I can sniffed out his yummilicious, scrumptious Mega Mac when he opened up the box but i pretended like i did not have binge on it at all. Inside... i was screaming like hell..at least he offered me a bite! And then... he offered me 'You wanna have a bite?' Offer came right after he wolfed down almost all of it. 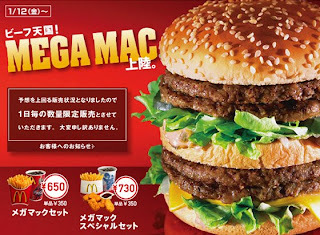 He left me a little tiny piece of that Limited Edition Mega Mac!! Well...tragically, i ate it. Ok, back to the topic on diet, i just 'brained out' the theories that i browsed from the books, internet, mags about diet, how to curb our cravings, how to control our eating binge bla..bla..bla.. i have read a lot about it but i remember only some of it. For example to make sure you get good shape; eat before 7pm, some experts says don't eat after midnight, some says we should empty our stomach after 10pm and bla bla bla... Well, different experts different theories. As life speeds up, the craving is speeding even faster! Look at the foods now, Ooo myy... even donuts..they commercialized it and come with tasty topping until i got drooling! If we follow this, InsyaALLAH we are going to be ok! Why not we follow this? Why we need to memorize and follow all that kapir punya diet!!"